Wow week 3 flew by really quick! The agenda for the week? 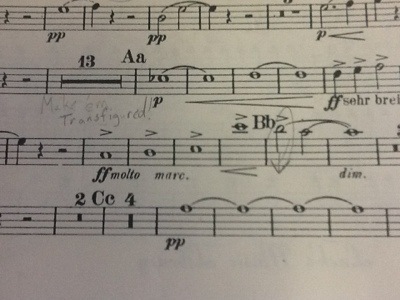 Strauss’ Death and Transfiguration. Literally that’s all I had to worry about. Since the previous week was a bit rough musically, I prepared more than usual for this week. The first rehearsal with Miriam Burns was fantastic. As a former staff conductor with the New York Philharmonic, you could tell she knew what she was doing and how she going to get across to the orchestra what she wanted. Very impressed with her rehearsals, our section worked well as a unit to play our best (plus, we wanted to redeem ourselves). D/T, I believe has become my favorite tone poem. The poem behind the music is great and the transfiguration was a glorious moment. I wrote in my part some motivation to play the four whole notes at the end with conviction (see below). Next week will be a longer post on the final week of the festival and my overall experience. For now, time to get ready for Enigma.